After photographing this little critter, I scanned the Internet to find out more about the caterpillar. What was not surprising to learn: their spiked hairs carry a skin irritant, and if one puts hands in mouth after touching, will be subjected to much pain and swelling. It seems, however, that despite the yellow and black coloring and spiked hairs, some humans cannot resist picking them up. As happens on the Internet, stories of cute animals being saved by someone spreads through social media like a a wildfire. Seldom do we here of an assist to our insect neighbors. 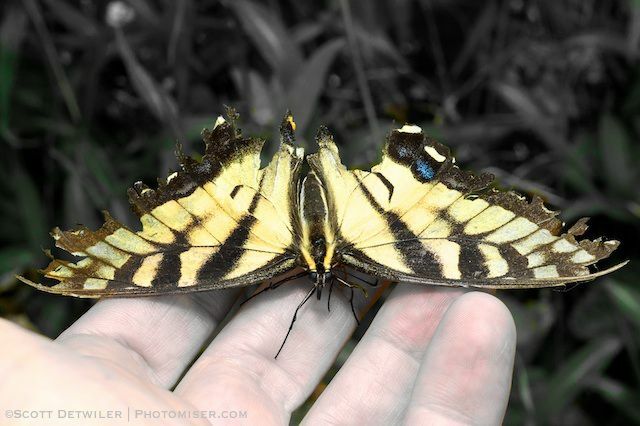 In this touching vignette, Scott offers a battered Swallowtail a last sip of nectar.